Zoé Hamstead, Buffalo. Timon McPhearson, New York. 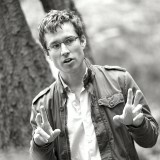 Adam Glenn, New York. Impacts of extreme heat are uneven across geographies and communities. People who live in micro-urban heat islands and who lack the capacity to cope with extreme heat are disproportionately vulnerable to heat-related health risks. Collaborative climate action planning processes should directly engage vulnerable communities in identifying neighborhoods with concentrated and multiple risk factors, as well as in co-producing strategies for reducing vulnerability. By engaging in collaborative processes of mutual learning and action, we might identify solutions for protecting people who are most at risk from extreme heat. 2016 is shaping up to be the one of the hottest years in human history, with record-breaking temperatures creating some of the most intense heat waves modern humans have experienced. During the month of June, for example, cities in many parts of the southwestern United States—including Burbank and Death Valley, California—experienced substantially hotter maximum temperatures (109-126ºF). In July, temperatures in two Middle Eastern cities—Mitribah, Kuwait and Basra, Iraq—reached the highest levels ever recorded in the Eastern Hemisphere (129.2ºF and 129.0ºF). The summer rounded out with heat waves striking northeastern U.S. cities. Philadelphia experienced the most 90-degree days in its recorded history, making it that city’s warmest August on record, and Washington, D.C. experienced its second-hottest summer on record, with consecutive 100-degree days and a record number of 90-degree days. Climate change will only exacerbate these warming trends in cities, at rates faster than the global average. Many local governments and residents in urban communities are understandably concerned about the impacts of these heat waves and overall temperature increases. In major cities with large and diverse populations that rely on public infrastructure and public services to meet peoples’ basic needs, some of the most urgent concerns focus on impacts on human health, human well-being, and damage to or suspension of crucial energy services, such as residential air conditioning. As with most challenges we face in the age of the Anthropocene, the impacts of extreme heat are not experienced equally across socio-cultural subpopulations. Who suffers from extreme events is a function of cumulative risk factors—determined by geography as well as personal, household, and community preconditions. However, these risk factors are not the whole equation. Climate action planning and related governance processes can be intentionally or unintentionally exclusionary, alienating minority and marginalized groups from decision-making processes that steer mitigation and adaptation investments. 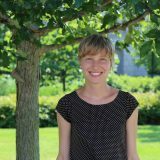 For instance, a recent study on “Urbanization, Exclusion and Climate Challenges” finds that religious minorities, recent migrants, and people living in poor neighborhoods and slums of surveyed Indian cities lack municipal governance and institutions that enable access to services such as all-weather roads, drainage, sanitation, and reliable drinking water. Structurally-exclusionary decision-making processes reinforce patterns of inequity that determine who suffers injury during extreme climate events. Planners must go beyond civil rights era stakeholder participation approaches (e.g., informing the public) to more meaningfully engage diverse actors, especially those who tend to lack political power. Through processes of mutual learning and action, we can envision strategies for creating more just and resilient urban futures..
Cities experience higher daytime temperatures and less nighttime cooling than surrounding (peri-urban) areas—a phenomenon known as the urban heat island effect (or UHI). This urban/peri-urban difference is driven by large amounts of built infrastructure which have thermal properties that facilitate concentrations of heat; fewer trees, vegetation, and soil that facilitate evaporation and evapotranspiration processes; and urban geometry configurations that cause air stagnation. People are exposed to extreme heat when summertime weather is hot and humid. Dramatic temperature spikes can be an important driver of heat-related morbidity and mortality, as can small differences between day and nighttime temperatures. Because these events are extreme relative to normal conditions, individuals, households, and communities are often unprepared to cope with their impacts. Since 2008, our global population has been mostly urban. By 2050, up to 70 percent of the world’s total population will live in cities and urbanized regions (United Nations, 2014). These urbanization trends and accompanying increased densities of people and built materials will only compound the urban heat island effect and its negative impacts on human health and wellbeing unless we begin to design, plan, and manage our cities differently. Understanding the spatial relationship between landscape compositions of buildings, green and blue space, bare soil, and paved or other heat trapping surfaces can help communities understand their exposure to heat and extreme heat. Left: NYC land cover and building height; Right: Surface temperature on July 15, 2011. In the United States, heat is the leading weather-related killer (Klinenberg, 2002; U.S. Environmental Protection Agency, 2014). High temperatures become dangerous to human health when people have difficulty maintaining their internal body temperatures. This condition can lead to heat cramps, heat exhaustion, or heat stroke, and can impact other health problems, such as circulatory or respiratory diseases. In the New York City metropolitan area, mean annual temperatures are projected to increase by 4.1–5.8ºF by the 2050s and 5.3–8.8ºF by the 2080s (New York City Panel on Climate Change, 2015). With these increased average temperatures, the region is also expected to experience a tripling of heat waves by the 2080s, leading to an overall 70 percent increase of heat-related premature mortality by the 2050s over a 1990s baseline (Knowlton et al., 2007). While direct heat-related health and human comfort impacts are among the most immediate concerns, extreme heat events are also problematic for energy consumption and air quality, leading to feedbacks that reinforce climate change. As temperatures rise, so does energy demand, which in turn leads to increased fossil fuel consumption. Fossil fuel consumption reinforces climate change, thus reinforcing extreme weather events, thus reinforcing our ever-growing reliance on fossil fuels. In addition, higher electrical demand increases air pollution emissions, and higher temperatures enhance ozone formation and evaporative emissions. Climate action strategies must not only reduce vulnerability to heat-related risk, but also disrupt the undesirable feedbacks through which some risk amelioration strategies (such as residential air conditioning) further drive climate change. Not everyone who lives in a city experiences the urban heat island effect in the same way. Temperature variation within a given city can be even greater than the average temperature difference between that city and its surrounding areas. Exposure to extreme heat is largely driven by conditions of the built environment and these conditions vary considerably across urban landscapes. The various compositions of landscapes and built environments that we find throughout cities have different temperature signatures (Hamstead et al., 2015). Areas of the city that are hot relative to the city as a whole are known as micro-urban heat islands. People who live in micro-urban heat islands are disproportionately exposed to heat-related health risks. 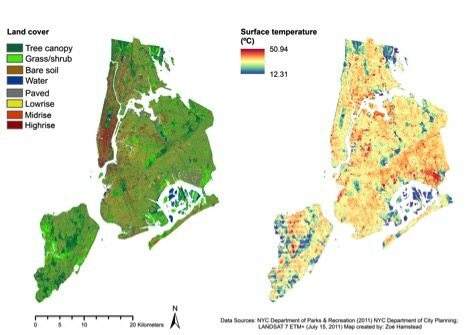 Spatially-explicit environmental data, such as land cover and surface temperature, can help communities identify distributions of exposure in cities like NYC (Fig. 2). Left to right: distribution of elderly individuals, Black/African American individuals; individuals below the poverty line and overall sensitivity index of all three sensitivity risk factors. Not only are people who live in cities exposed to heat differently, but even those similarly exposed to hot conditions are not necessarily impacted by those conditions in the same way. 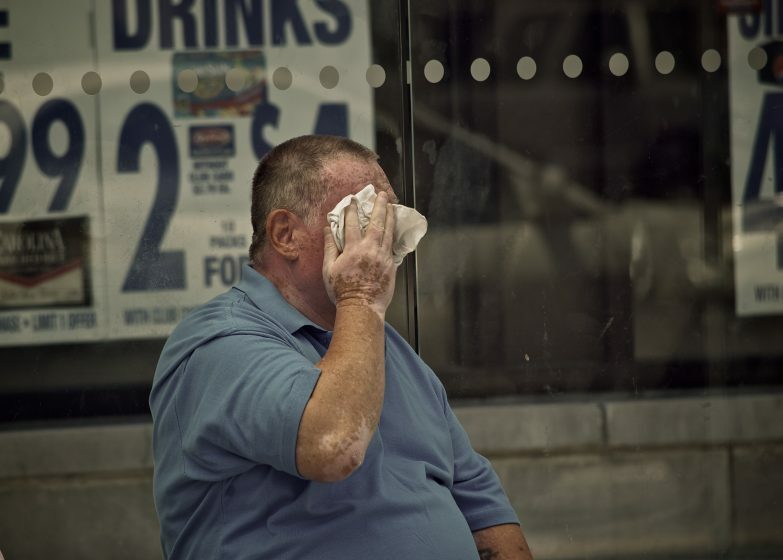 People with physical, mobility, or economic constraints can be disproportionately sensitive to heat-related health impacts, as can those with cognitive impairments or those living in social isolation. For instance, in New York City, recent studies have found that Census Tracts with high proportions of African American and economically-constrained populations tend to have relatively high levels of heat-related mortality (Madrigano et al., 2015; Rosenthal et al., 2014). Demographic data provided by the U.S. Census can provide indicators of extreme heat sensitivity. City governments, including New York’s, have begun to recognize that extreme heat is an increasingly dangerous threat to urban residents. In New York City, the Mayor’s Office of Recovery & Resiliency has established an Urban Heat Island Task Force to examine the causes and consequences of UHI and extreme heat in the city, and to develop community-based and citywide solutions for building resilience to heat-related threats. Yet unlike hazards such as floods and storm surges, which are commonly studied by agencies such as the Federal Emergency Management Agency in the United States, communities often lack basic knowledge of where extreme heat threats are likely to have the most impact, and who is most likely to be affected. Mapping distributions of extreme heat vulnerability and understanding the fundamental drivers of heat-related risks are crucial components of spatially-planning extreme heat mitigation and adaptation strategies. Distribution of combined exposure and sensitivity to extreme heat in NYC. People who experience multiple forms of risk—such as people of minority race status who are also living in poverty in communities that are highly paved and lack tree canopy—can be particularly vulnerable to heat-related impacts. By identifying neighborhoods with concentrated and multiple risk factors, we can identify geographic concentrations of risk and better focus risk reduction interventions where they are needed most. In NYC, one such high-risk neighborhood, Harlem, was the focus of a pilot project during the summer of 2016 that used participatory community engagement techniques to gather thermal data from inside residents’ homes, where heat stress can be an invisible public health risk. The collaborative Harlem Heat Project, led by climate news service AdaptNY, involved community members, journalists, scientists and residents. Approximately 30 citizen scientists were recruited through the community-based organization WE ACT for Environmental Justice to place inexpensive, hand-built heat-tracking sensors in their homes. During the course of the experiment, residents also shared their experiences on a digital journaling platform ISeeChange, that matched their observations to NASA satellite weather data. These stories were reported by the project’s mass media partner, WNYC, which revealed how poverty, restrictive regulation in public housing, and other factors left Harlem residents especially vulnerable to heat’s ill effects. (See also this short video on the project at the Huffington Post). 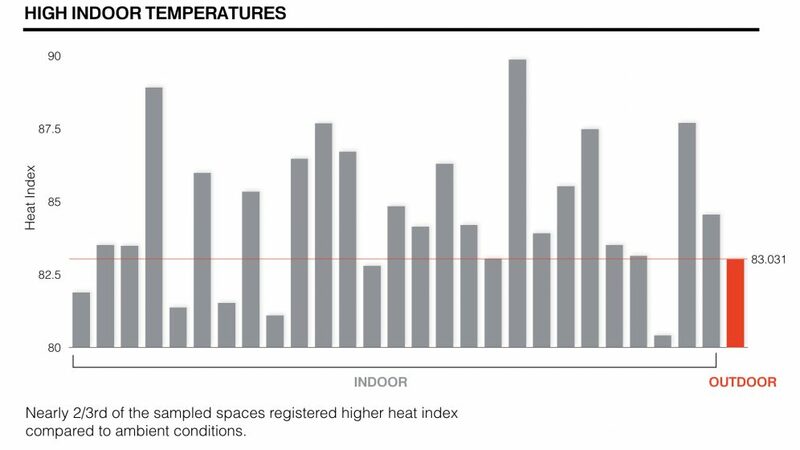 Subsequent analysis of data from the sensors—which captured thousands of temperature and humidity measurements over an approximately two-month period—found that for two-thirds of residences, the indoor heat index was consistently higher than ambient conditions, and that because of thermal inertia, indoor temperatures lag heat waves, warming and cooling slower than outdoor temperatures. This suggests that it may be possible to forecast indoor heat waves, as distinct from outdoor heat waves. The summer project culminated in a collaborative community workshop in which residents, experts, media, and local officials used the project findings to collectively brainstorm possible solutions to urban heat risks, such as the creation of a more advanced sensor that could serve as an early warning system during periods of dangerous indoor heat. The project team presented solutions to a high-level panel of representatives from city government, foundations, and community-based organizations, and these are currently the subject of ongoing development. 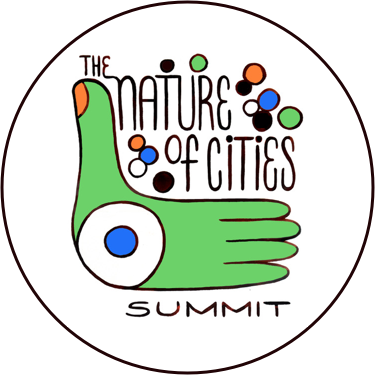 The project as a whole represents an important new way not only to collect elusive indoor readings, but also to involve citizens in the processes of gathering data, presenting narrative experiences, and offering a transformative strengthening of the sometimes fraying relationships among communities, city officials, scientists, and local news media. Extreme heat vulnerability reduction in urban areas will rely on a broad array of strategies, expertise, knowledge, and engagement. Some strategies involve incorporating landscape features that reduce exposure to extreme heat into the urban built environment. Urban greening—planting trees and vegetation—as well as “blue-ing” and “turquoise-ing” (Childers et al., 2015)—increasing access to surface waters, restoring wetlands, and daylighting underground streams to above-ground channels—will help to cool air temperatures through processes of evaporation. Increasing water infiltration through green roofs, porous paving, and other green infrastructure will promote cooling through evapotranspiration. These kinds of public investments have numerous benefits beyond moderating temperatures—particularly if they are designed in such a way that enables people to access and use them for recreation or other kinds of activities (McPhearson et al. 2016). 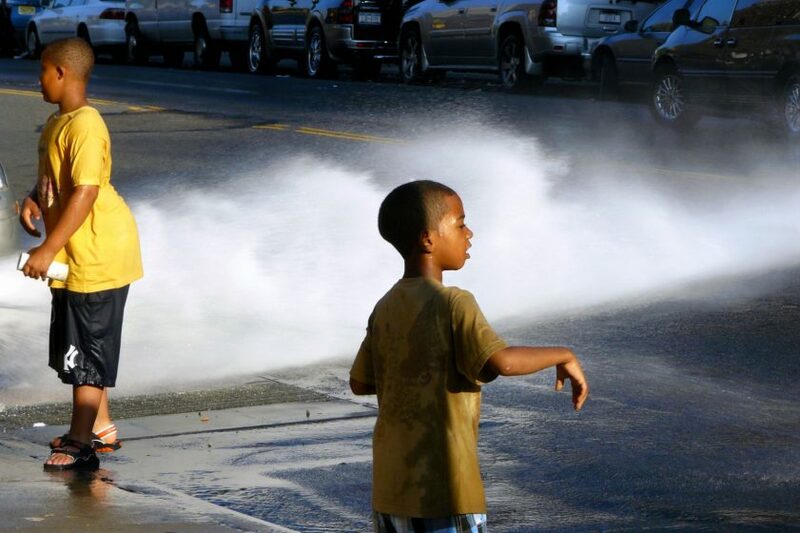 We can also build community capacity to respond in the event of an extreme heat threat, as efforts such as the Harlem Heat Project are beginning to do. By developing emergency response or early warning protocols for nursing homes, public housing, and other residential communities that are especially at risk, we can develop ways for people to better access the resources they may need in the event of a hazard. Other public investments—such as cooling centers and community spaces with air conditioning—could be designed as hubs that enhance social cohesion, strategically located in areas with concentrations of people who may be at risk. Perhaps most importantly, urban communities need robust processes of democratic participation that enable people whose voices are often left out of planning processes to engage in decision-making and help steer public investment where it is needed the most. For instance, a United States National Science Foundation-funded urban resilience project (URExSRN) taking place in 10 U.S. and Latin cities is engaging communities in scenario development workshops. These workshops, held in partnership with NGOs, city planners, and local community activists, are intended to provide opportunities for residents, community leaders, and particularly underrepresented voices to connect their insights and goals to larger scale, citywide planning processes. In NYC, WeACT, the West Harlem Environmental Action advocacy and community planning group, as well as the NYC Mayor’s Office of Recovery & Resiliency, and other city agencies, academics, and community organizations, are collaborating to develop community-based, data-driven innovations for reducing risk to heat waves and other climate driven extreme events. The fact that risk of injury due to extreme heat (among other threats) is not evenly distributed across social groups is emblematic of deeper structural inequality embedded in our systems of governance and economy. Differential access to crucial resources such as healthcare, healthy living conditions, high quality education, and robust social networks are reinforced through decision-making processes. Climate action processes that rely too heavily on existing governance structures may serve to reinforce the power structures that produced differential vulnerabilities. By engaging in collaborative processes of mutual learning and action—such as vulnerability assessments or resilient futures scenarios that are co-produced by local communities and city agencies—we might identify solutions for protecting people who are most at risk. During crises, communities with engaged and self-empowered citizens supported by social institutions fare better, often regardless and in spite of geography and socio-economic status. Yet, our decision-making processes tend to be democratically weak at best, and authoritative at worst. As anthropologist David Graeber notes in The democracy project, even when opinions are shared by a majority of Americans (let alone those that stem from pluralist or minority values), they can be entirely left out of mainstream political discourse (2013). 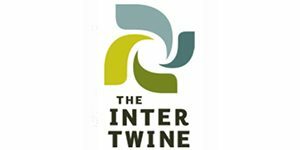 Direct, participatory democracy through techniques such as collaborative community design is necessary to address societal problems whose impacts are disproportionately felt: climate change, poverty, energy dependence, lack of access to employment, extreme weather events, and the like. City agencies, civil societies, and citizens—informed by the expertise of engineers, climatologists and others—can collaboratively develop effective mitigation and adaptation strategies in ways that tackle structural inequality. 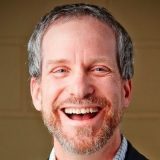 Adam Glenn is an award-winning journalist, media consultant and educator who has worked in newsrooms in New York and Washington, D.C.